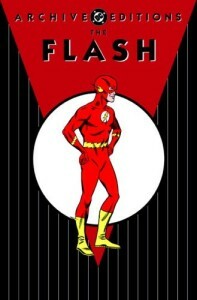 Keith Dallas (author of The Flash Companion) spotted The Flash Archives Volume 5 on Amazon.com, with a release date of March 10, 2009. The detail page doesn’t list contents, just that it’s 248 pages. Like most of DC’s Archive Editions, the list price is $50 (still less than it would cost to track down the originals in decent condition), but Amazon is currently offering it at a 37% discount. Interestingly enough, going through Flash #140 would exactly match the current span of the cheaper, black-and-white Showcase Presents: The Flash collections (volumes 1 and 2). Update (October 2008): The official solicitation is out, and it covers #133-141 — one more issue than predicted. The additional issue contains another milestone: the first appearance o the Rogues’ tailor, Paul Gambi. This entry was posted in Flash News and tagged Archives, Collections, Silver Age on August 30, 2008 by Kelson.